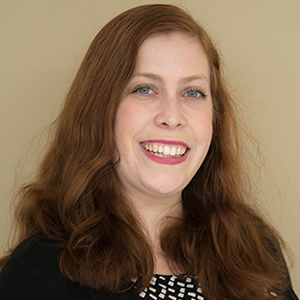 To treat atherosclerosis, a cardiovascular disease in which a buildup of plaque causes an artery to narrow, doctors can insert a tiny wire mesh tube called a stent into the obstructed artery. Expanding the stent opens up the artery and helps restore blood flow. To successfully perform this operation and minimize potential health hazards, stent designs must be thoroughly studied and optimized. 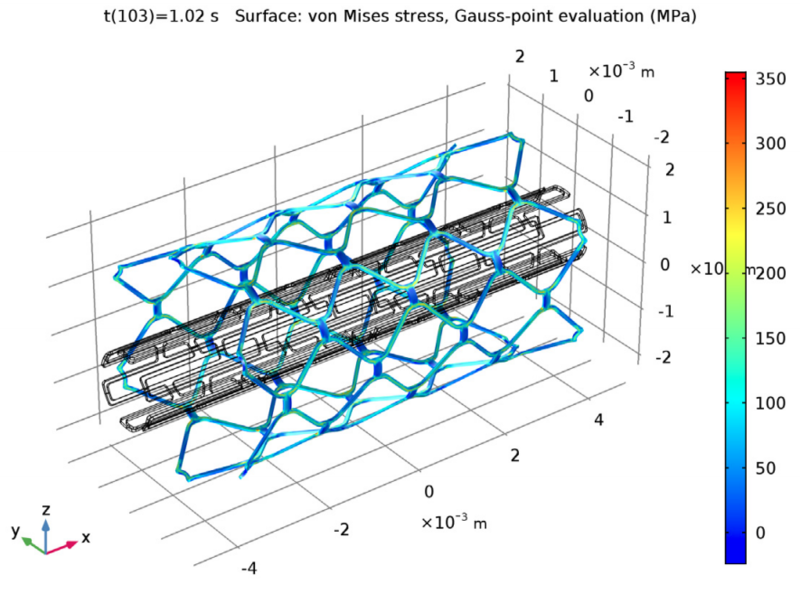 To do so, we can perform a nonlinear structural mechanics analysis with the COMSOL Multiphysics® software. One common treatment for atherosclerosis is a procedure called percutaneous transluminal angioplasty, which removes or compresses unwanted plaque that has built up in a patient’s coronary artery. This procedure sometimes relies on stents, placed within a blocked artery by an angioplasty balloon. After reaching the intended location, the balloon inflates the stent, which locks into an expanded position. The balloon is then deflated and removed, while the stent remains in the artery. 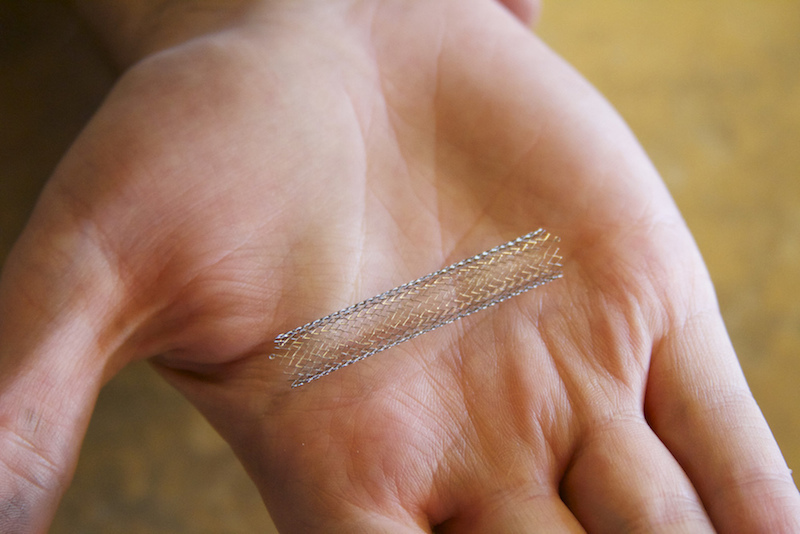 The expanded stent functions like a scaffold, keeping the blood vessel open and enabling blood to flow normally. A stent example. Image by Lenore Edman — Own work. Licensed under CC BY 2.0, via Flickr Creative Commons. Of course, for the angioplasty procedure to be a success, the tools used must perform as intended. If the ends of the stent expand more than its middle — a common defect known as dogboning — the artery can face serious damage. Another potential issue is foreshortening, which makes it challenging to position the stent and can also damage the artery. To avoid these issues and make the angioplasty a success, it’s necessary to evaluate stent designs. 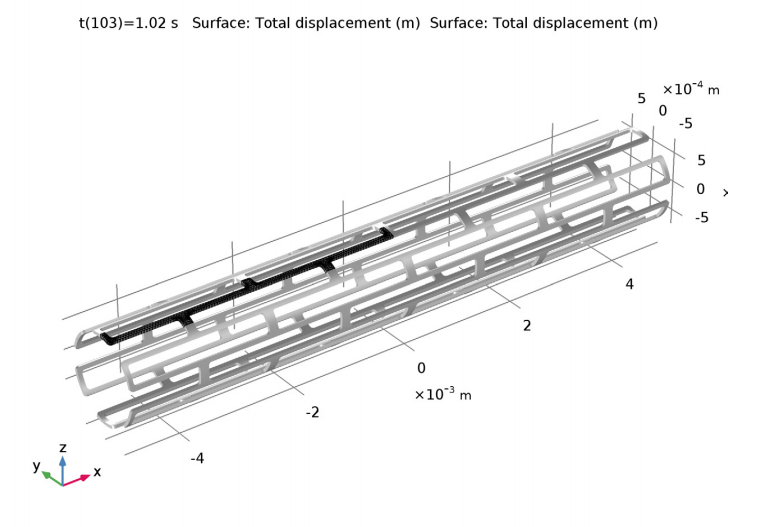 One step in this process is analyzing the deformation experienced by a stent. For this example, let’s examine a Palmaz-Schatz stent model, the geometry of which is seen below. 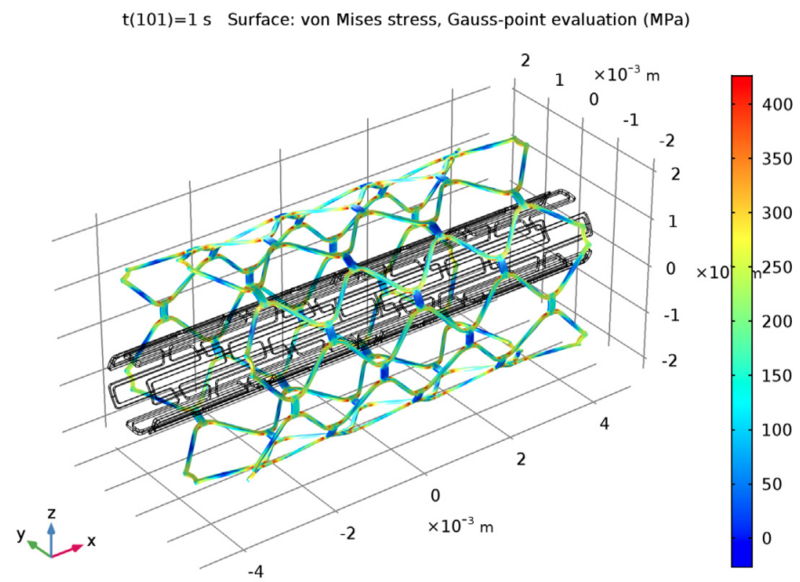 This model looks at the stress and deformation in a stainless steel stent that is expanded via a radial outward pressure on the tube’s inner surface. 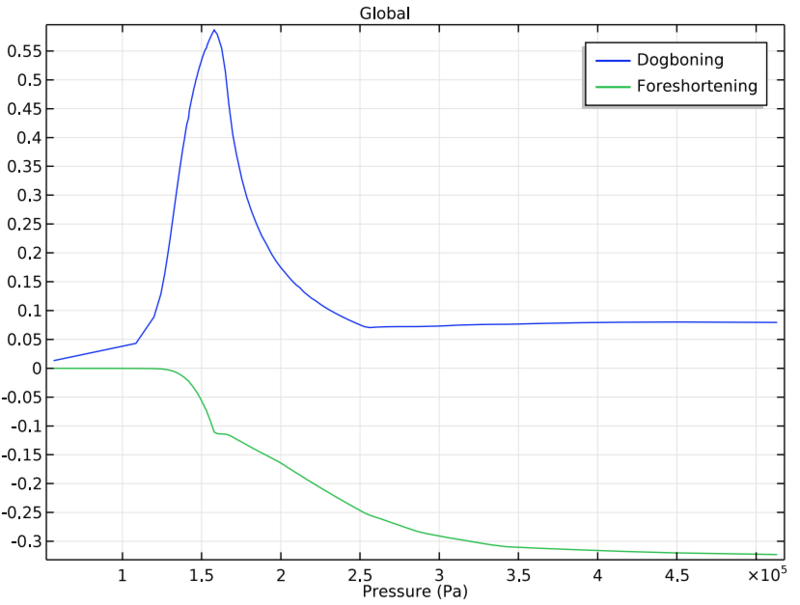 (The pressure represents the balloon expansion.) The original diameter of the stent is 0.74 mm, but after the expansion period, the middle section has a diameter of 2 mm. Thanks to the inherent symmetry of the stent’s geometry, we can minimize the computational costs of this simulation by reducing the size of the model to 1/24 of its original geometry. The full stent geometry. The reduced geometry used in this example is represented by the darker meshed area. First, let’s look at the various stresses and strains experienced by the stent during operation. Below, we see the stress distribution in the stent at maximum balloon inflation (left) and the residual stress in the stent after balloon deflation (right). As expected, stress in the stent is reduced after the balloon deflates. Stress in the stent during balloon expansion (left) and after balloon deflation (right). Moving on, we analyze how the effects of dogboning (blue) and foreshortening (green) change in relation to pressure during balloon inflation. Using this plot, we can check for potentially harmful effects in the stent design and optimize its performance. Dogboning and foreshortening in the stent vs. the pressure in the angioplasty balloon. We also examine the effective plastic strains in the tube at maximum dogboning, as seen in the following image. Effective plastic strains and deformation at the time of maximum dogboning. The peak value is about 25%. In regard to the recoil parameters, note that the longitudinal recoil is around −0.9%, the distal radial recoil is about 0.4%, and the central radial recoil is approximately 0.7%. These parameters provide more details on how the stent behaves when the inflated balloon is removed. 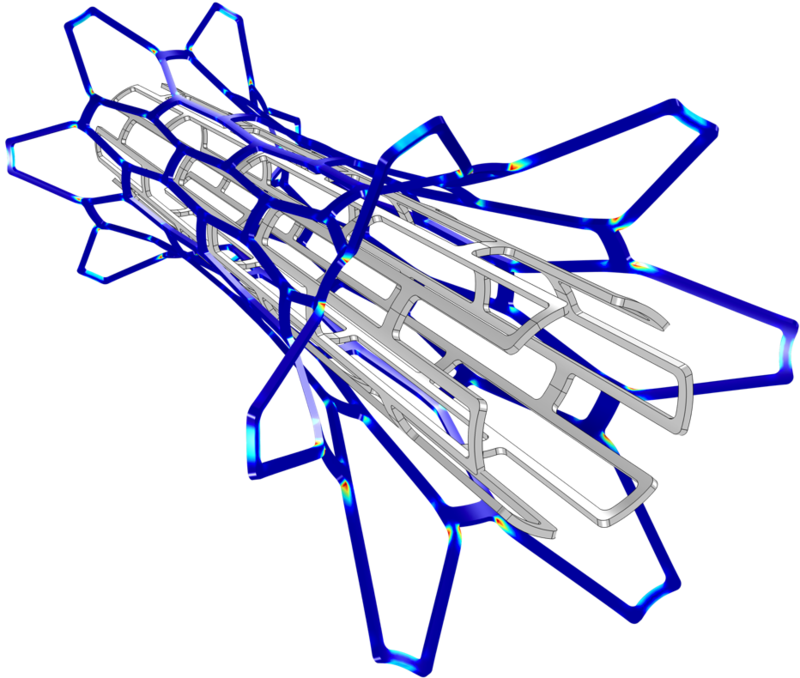 With the information provided by simulations like this one, engineers can improve the design of stents and optimize their use in biomedical applications. To try this example for yourself, click on the button below.